To provide residents in Greater Glasgow and Clyde with a first class healthcare service, two new multi-million pound Health and Social Care Hubs in Gorbals and Woodside have been commissioned. After groundwork initially began in July 2017, attention was quickly turned to the finer details required to complement the design of the building. With the new facilities set to provide local residents with access to state-of-the-art health and social care services, it was only fitting that modern healthcare seating solutions would be installed throughout the centre. 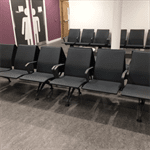 This is why the contractors, Morgan Sindall Construction, and architects, JM Architects, selected Zoeftig to provide a complementary yet comfortable and stylish healthcare seating solution. 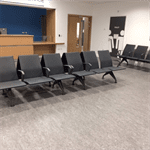 The inFINITE range was selected as the perfect fit, with over 200 healthcare seating solutions in a stylish black colour installed throughout the building. Our inFINITE range was chosen due to the outstanding durability of the polyurethane construction, taking resilience and durability to new levels. What’s more, the easy to clean inFINITE range can also be finished with additional anti-microbial properties and chemical resistance to contribute towards a hygienic waiting area.